An internet message purporting to be from the North African wing of al-Qaeda has urged Mauritanians to take up arms against their coup leaders. Last week, General Mohamed Ould Abdelaziz and other military officers toppled the country's first democratically-elected president. Gen Abdelaziz said defeating extremism was one of his main priorities. 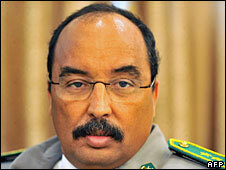 Al-Qaeda in the Islamic Maghreb is largely based in Algeria but has been blamed for attacks in Mauritania. The government said it killed four French tourists last December, an incident that prompted the cancellation of the Paris-Dakar car rally. It also blamed the group for attacking the Israeli embassy in the capital, Nouakchott, in February. The internet message alleges that despite wide condemnation of the coup by Western governments, it would not have been possible without the approval of France, the United States and Israel. The statement is apparently signed by the leader of al-Qaeda in the Islamic Maghreb, Abdelmalik Droukdal. The BBC's James Copnall in Nouakchott says Mauritania is extremely poor, and its young people are increasingly radicalised. In addition the country is almost entirely an empty desert, and the vast open spaces make it easy for illegal groups to avoid detection. That is one of the reasons the US has funded the Mauritanian military, our reporter says - although that aid has been frozen following the coup. What does coup mean for Islamist militants?